There's a good chance that you already understand the many benefits that come with integrating SugarCRM with MailChimp. Benefits like saving time, keeping your sales and marketing teams on the same page, and getting maximum value from your company's data. That's likely what brought you here. Data are to this century what oil was to the last one: a driver of growth and change. Flows of data have created new infrastructure, new businesses, new monopolies, new politics and—crucially—new economics. That's from a recent article in The Economist. There are few people that would argue with what's being said here. Data aren't just a part of the business and economic landscape, they're a key driver. A lifeblood. But wait a second… you might be thinking, I thought we were just talking about integrating SugarCRM and MailChimp. That's true. Except for the "just" part. A mistake when thinking about phrases like "Big Data" is to just think about IBM's Watson or a massive Google data center. Sure, those are examples of the scope and value of data in today's world. But so is the data that your business is collecting in the form of leads, customer information, campaign results, segment engagement, geographic and demographic reach, and so on. How often do you consider the incredible valuable of this information? Optimizing and leveraging your data is not a nicety, it's a must. Imagine if somebody built a wall that split your office in two. Now when employees want to interact, they have to physically leave their side of the building and walk over to the other. That's incredibly inefficient. And completely unacceptable. (Except, maybe, for the folks focused on their Fitbit step count!). That's a silly picture. But is it really all that different when data are collected and managed in multiple applications without an easy way to sync and share across the applications? We know what Ronald Reagan would say: Tear down this wall! So… tear down the wall! With SugarChimp, your data is seamlessly shared between SugarCRM and MailChimp. The walls are history. The silos are history. And, maybe best of all, the annoying… and time-consuming… and error-prone process of manually syncing data between the two applications is history. I don't want you to believe how true that is, I want you to see for yourself. Which is why we offer a free 30-day trial of SugarChimp. The mantra "right place, right time" goes for data just as much as it goes for anything else. For your salespeople and outreach specialists, having the right data at their fingertips is critical. That's why you chose SugarCRM in the first place – it provides a simple, effective one-stop for the information that your team needs to communicate with customers and prospects. That's important, because when a meeting is in progress, clicking around to multiple sites, windows, and applications is distracting and can destroy the rapport and flow of the conversation. We realized that when we built SugarChimp, and that's why we built dashlets directly into SugarCRM that allow users immediate access to MailChimp campaign data, as well as the engagement activity of individuals. This arms salespeople with the knowledge of what campaigns users are opening or even which email links they've clicked. Having this at the ready during a call can mean the difference between closing a sale and… well, not. Individual user activity reveals what activity a customer or prospect has taken. Have they been opening certain email campaigns? Clicking on product links? 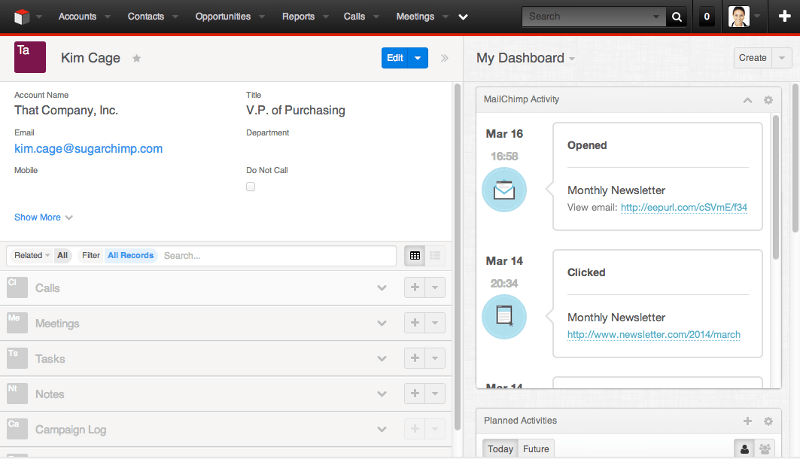 With SugarChimp, your team can see this all without leaving SugarCRM. How have campaigns been received? Which themes and approaches have been most effective? 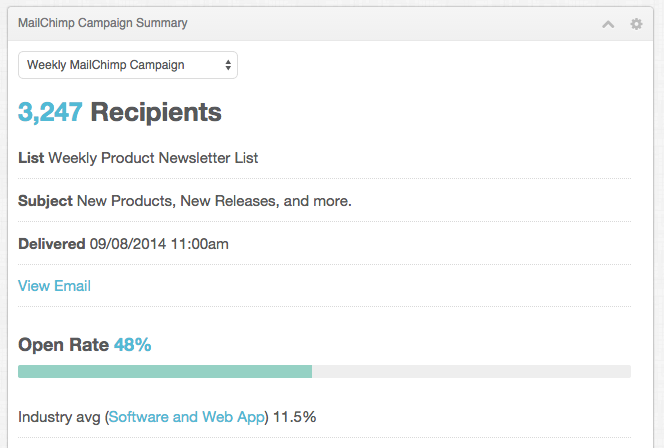 With SugarChimp, both sales teams and managers have easy insight into key email-marketing performance. Most clichés end up clichés because they're true. In the business world, that old saying "time is money" is a great example. Your team members' time is valuable, and when you can save them time, you free them up to tackle new opportunities that can advance the company and drive profit growth. If you're already manually syncing data between MailChimp and SugarCRM, SugarChimp will free up your admin and development teams to focus on new areas for improvement. Rather than wasting time with continual manual syncing, their time and efforts can go towards creative solutions to other challenges your company is facing. Besides the impact of the higher-value work your team members could be taking on, I'd venture to guess that they'd rather be working on new, creative challenges as opposed to manually syncing data across platforms. For your sales teams, SugarChimp means that marketing and engagement information is right at their fingertips in Sugar, in easy-to-use dashlets. No more jumping between applications to determine which prospects are primed to buy and should be at the top of their calling list… or which customers appear unengaged and could use a check-in call. Marketers are likewise empowered by having prospect- and customer-list information updated across platforms, allowing them to segment and target their campaigns effectively, using variables and fields that are consistent across both MailChimp and Sugar. They can also be assured that results of their efforts are properly delivered to other teams, thereby reducing unnecessary data "handoffs" and avoiding oversights. SugarChimp can also be used in conjunction with MailChimp Automations, allowing your teams to trigger automatic email campaigns based on changes in fields within either MailChimp or SugarCRM. This means more communication with customers and prospects, at the right times, without additional manual effort. Finally, mangers will have easy access to the key data they need to evaluate sales and marketing performance, without having to mess around with multiple programs and worry about whether data has been properly updated. I recently read a scathing review of a company's management team that said management had "big talk, but small steps." A good reminder that it's often much easier to say something than to follow through. That's why we take feedback from our users so seriously and are very proud of the excellent feedback that we've received for SugarChimp. "SugarChimp is exactly what we needed, it syncs nicely between MailChimp and Sugar. The added MailChimp dashlet is very sophisticated, it’s nice to have that quick-view window when conversing with the customer. Big shout out Chad Hutchins, not only did he help out with the synchronization and work flow between systems, he gave excellent insight and provided helpful tips all around. Works great – thank you!" "SugarChimp does a great job of syncing all of our registrant information between Sugar CRM and MailChimp. We have a large number of custom fields that weren't mapping properly, and they helped get everything set up and working smoothly. They go the extra mile with one-on-one support!" Where will your company's next creative breakthrough come from? Too often creativity is viewed as a mystical process available only to prodigies like Steve Jobs. Creativity is the outgrowth of deep domain knowledge, the mixing of information and ideas from different areas, and the ability to step back and see the big picture. Sound like a tall order? Sure, but we're here to help. SugarChimp helps create the conditions for your team and company to have the kind of creative breakthroughs that can take your business to the next level. By bringing together key marketing and engagement data from MailChimp and the customer and sales information from SugarCRM, team members are better positioned to see the big picture and "stumble on" creative insights. This would be much less exciting if a complicated and lengthy setup process were required. Set-up is quick and easy, and, better still, we've created a four-minute video that walks new users through set-up from start to finish. (Did I mention it's just four minutes?). That goes along with our extensive online documentation and our YouTube channel with additional videos to help you get the most out of SugarChimp. "Great product and great support!" "Awesome product, even better support." "They go the extra mile with one-on-one support!" During working hours, we typically respond to customer inquiries within hours minutes. Click here for your free 30-day trial! With SugarChimp you don't have to worry about duplicate entries. Duplicate subscribers are never added to MailChimp and when MailChimp data is synced to Sugar, SugarChimp will never create a duplicate entry. Concerned about security? Good! We are too. SugarChimp integrates with MailChimp via APIs ("application programming interface") – which MailChimp describes as a way to "allow other apps to access your account without you giving out your password". Communication between SugarChimp and MailChimp uses SSL, as does communication between SugarChimp and SugarCRM (provided the Sugar server is set up with SSL). 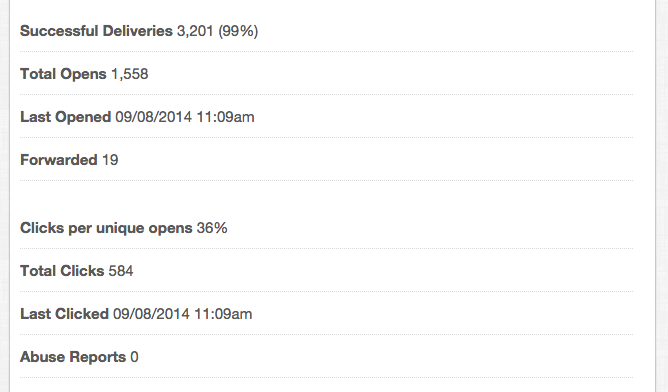 Do you rate prospects using MailChimp's handy star rating system? 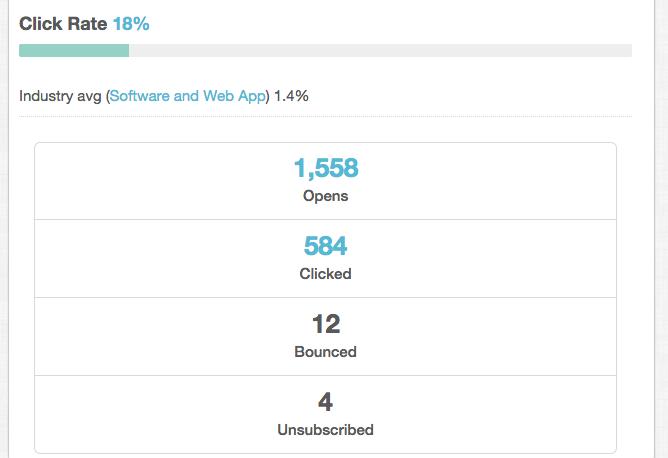 You can sync that between MailChimp and Sugar too. And whether you use Sugar or SuiteCRM, SugarChimp will be compatible with your system if you are on Sugar 6.5.x, 6.7.x, 7.x (including On Demand) and SuiteCRM 7.x. We provide a consistent experience across all of these setups. We built SugarChimp to be straightforward and simple. Simple to install, simple to set up, simple to use. But many companies we've worked with have benefitted from our personalized two-hour training package. This is hands-on training tailored for your company and your users, to help you get the most out of SugarChimp, and put you on the path to becoming a SugarChimp Superuser. MailChimp and SugarChimp training is free with our SugarChimp Ultimate Plan, or you can purchase training separately. We're here to support you and make sure you understand all of the advantages of SugarChimp. You can reach us by using the "Ask a Question" button at the top of this page, or emailing us at support@sugarchimp.com. Bi-directional, always-on integration that syncs target lists in both directions. Keeps your data clean. Prevents duplicate subscribers.